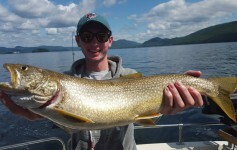 As summer nears to a close here in Lake George , fishing keeps right on going. Water temps are starting to cool but are still quite warm. Lakers are being taken 75 to 100 feet in the mornings, but by 11 a.m. or so they are back down deep. When water temps cool down, another salmon fight should turn on. Get ready and get prepared. 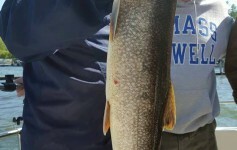 Highliner will be fishing all through October. Give us a call 518-885-3838. We’ll not only get you on the water but we’ll get you on the fish.